Book Review – Creation or Evolution: Do We Have To Choose? 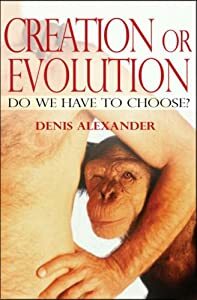 More than a year ago I was lent this book by the pastor and I have eventually finished it (http://www.amazon.co.uk/Creation-Evolution-Do-Have-Choose/dp/1854247468). The book is held up by some as a refreshing view on the relationship between Christianity and Evolution. I found the book mixed and ultimately disappointing, but there are some good bits in it. On first handling the book it is clear that the intent is going to be to show how acceptance of evolution does not have to be at the expense of religious belief, specifically Christianity. This aspect interested me, given my journey, so I started the book specifically looking for how it would answer that specific challenge. Most of the book is devoted to explanations of various bits of evolution. By necessity they have to contain a certain amount of technical language. However, I found on the whole that the passages on evolution are lay friendly and do a good job of explaining why evolution is not only a valid theory, but an accurate description of observed fact as best we know it. The book explains well how evolution is a naturalised process and our knowledge of it has no pre-requisite of any god. The processes we understand are fully explained and there are no missing bits that require the invocation of the supernatural. Creationism and ID are also dealt with effectively, albeit with far fewer pages. They are accurately shown to be scientifically deficient and their need to have a god directly be involved to ‘push the process along’ is shown to be a limiting factor for which there is nothing to show. One good point that is made in the book is the argument for beauty. Many creationists will look at the world we see now and argue that the beauty there can only have been put there directly by god. I once made precisely those arguments. The book counters by saying that the processes that made us and all we see around us are no less beautiful and they too came from god. When a creationist views the world and sees beauty and says it must come from god, they are by implication saying that the long processes that made the beauty they see can not be beautiful because they don’t believe god did it that way. This is a dangerous way of thinking because it creates a closed mind and stops that believer from fully appreciating the glory of their god’s creation. The book explains well why creationism and ID are not valid. So the big question I wanted to book to answer was, given the above, how does the author, who professes his faith at several points throughout the book, demonstrate that belief in god is consistent with evolution and, more specifically, show that there is a logical reason to hold that view. Sadly, the answer just doesn’t come. No matter how much I wanted to see an argument for god, it just didn’t happen. The book successfully argues for the science of evolution and against the god of creationism. As a result it has confirmed my position as an atheist and done nothing at all to tempt me back to faith. I suspect the author would be disappointed, but he should not be surprised.